Please Follow Measuring Instructions Carefully! You should have a friend, family member or, for the best results, a professional seamstress/tailor take your measurements. Taking your own measurements will almost always result in inaccuracies. It's best to be measured wearing the exact undergarments, slip, and shoes you'll be wearing. Designers determine their size by the bust, waist, and hip measurements. 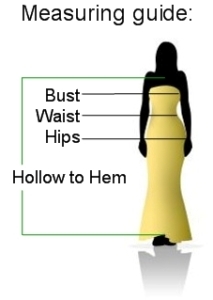 Some will also include a "Hollow to Hem" measurement; this is the measurement from the base of the neck (hollow of the neck) to the bottom of the hem. Use ONLY a standard cloth measuring tape. Do not pull the tape tightly; it should be just tight enough to stay in place. 1. Stand straight with your heels together and your arms down at your side. Once you have taken your measurements, refer to the designer's size chart that applies to your garment. The designers' size charts show the approximate measurements they use to make each size. Compare your measurements to the size chart to determine the correct size. If you cannot match your exact measurements to all three measurements indicated on the designer's size chart, we suggest ordering according to the largest measurement. Remember, garments can be taken in, but taking them out depends on the seam allowances which, in most cases, are very narrow. It is suggested that you take into consideration the type of fabric and style of the dress, as this also influences sizing. If you are still unsure after viewing a size chart for your dress, please contact us at (904)-779-9000 or 1-866-594-7766. We will be very happy to help you!